“Monterosa. Liberamente femminile”. Three words that express all the beauty, the energy and the passion we want to let you discover with all the activities included in this program. Literally it means “Monterosa. Openly feminine”. MONTEROSA, namely our mountains, our valleys, our slopes, our tracks. All the places we wish to introduce you to. They’re fashionable in every season! LIBERAMENTE, namely to free your mind from any cliché and find your own way towards happiness. FEMMINILE, because this program is for women only. “Monterosa. Liberamente femminile” aim to encourage women to have some quality time for themselves: we want you to get some time for growing your passions and for discovering new ones; we want you to challenge yourself and feel powerful; we want you to make new friendships. We want you to be the best version of yourself! The first incentive is for all our female skiers: our “Pink Wednesday” are the mid-week appointment when you can buy your daily skipass with a 30% reduction. But we wanted to do more! That’s why, in 2018 the “Pink Edition” was born: it is the most iconic skipass Montersa Ski has ever had, conceived for celebrating Women’s International Day on March 8th. What makes unique this ticket is the incredible word of mouth it generates: in order to activate the super special price – € 9,00 for the 2019 Edition! – it is necessary to reach the minimum threshold of 1.000 skipass purchased. A demonstration that the strength of the women is above all in supporting each other. 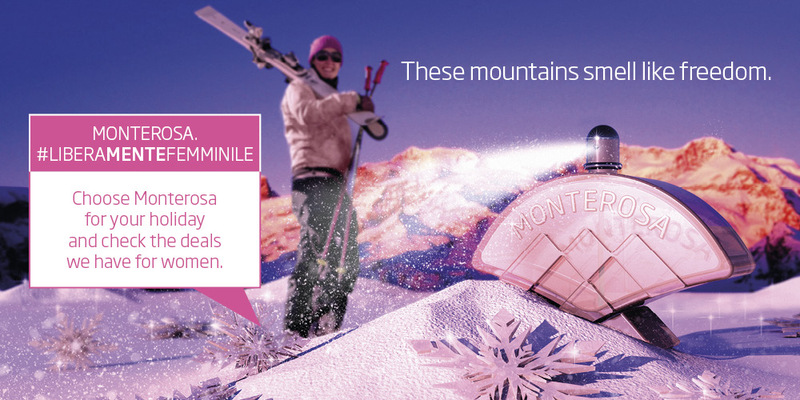 The Pink Edition skipass is available only online and it’s possible to buy it from December to the first Sunday in March and it allows you to ski in every ski resort of the Monterosa Ski Group only on March 8th. We have to say that our “Pink Experience” are the biggest challenge in this project: activities to experience to cross your lines, to beat your fears and become the most powerful version of yourself! A positive way to challenge yourself supported by other women who decided to get in the game and achieving their dreams. Behind each Pink Experience you will find nice, kind and professional women: Laetitia Roux, undisputed ski mountaineering championess, Lisa Borzani, an embarrassing number of km in her legs and winners for 2 years in row of Tor des Géants, Anna Monari, engineer who become a mountain guide and choose our mountains and the glacier as her office.